A rather humble looking fountain set into the railing outside the Church of St Sepulchre-without-Newgate at the corner of Giltspur Street and Holborn Viaduct, it’s easy to overlook this important part of London’s historic fabric. 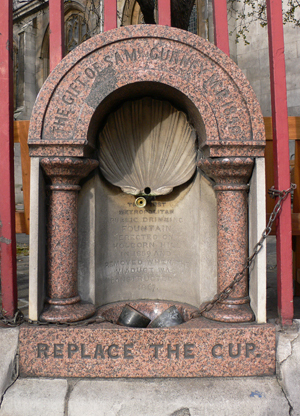 But this free water fountain is London’s oldest and was installed here on 21st April, 1859, by the then Metropolitan Drinking Fountain Association. Established by Samuel Gurney – an MP and the nephew of social reformer Elizabeth Fry, the organisation aimed to provide people with free drinking water in a bid to encourage them to choose water over alcohol. Within two years of the fountain’s creation, the organisation – which later changed its name to Metropolitan Drinking Fountain and Cattle Trough Association in reflection of its expanded role in also helping animals – had placed as many as 85 fountains across London. The fountain on Holborn Hill was removed in 1867 when the nearby street Snow Hill was widened during the creation of the Holborn Viaduct and the rails replaced but it was returned there in 1913. Rather a poignant reminder of the days when water wasn’t the publicly available resource it is today, the marble fountain still features two small metal cups attached to chains for the ease of drinking and carries the warning, “Replace the Cup!”.